It’s not enough to say that the CIO is the geek who wears the suit, IT leaders must, now more than ever, take a seat at the table. 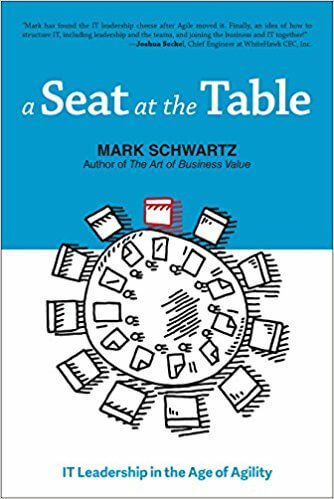 In A Seat at the Table, CIO Mark Schwartz explores the role of IT leadership as it is now and opens the door to reveal IT leadership as it should be—an integral part of the value creation engine. With wit and an easy style, Schwartz reveals that the only way to become an Agile IT leader is to be courageous—to throw off the attitude and assumptions that have kept CIOs from taking their rightful seat at the table. CIOs, step on up, your seat at the table is waiting for you. If someone stole your wallet, you'd notice it. So why don't people notice when they are robbed of something much more valuable than their wallet―time? Today's workers are drowning: nonstop requests for time, days filled to the brim with meetings, and endless nights spent heroically fixing the latest problems. This churn and burn is creating a workforce constantly on the edge of burnout. In this timely book, IT time management expert Dominica DeGrandis reveals the real crime of the century―time theft, one of the most costly factors impacting enterprises in their day-to-day operations. Through simple solutions that make work visible, DeGrandis helps people round up the five thieves of time and take back their lives with time-saving solutions. Chock-full of exercises, takeaways, real-world examples, colorful diagrams, and an easy-going writing style, readers will quickly learn effective practices to create high-performing workflows within an organization. The technology world―and indeed the whole business world―is moving at a pace faster than ever before, and it shows no signs of slowing down. Instead of consigning ourselves to the pressure cooker of the modern world, it's time to elevate how we work. It's time to level up our game. 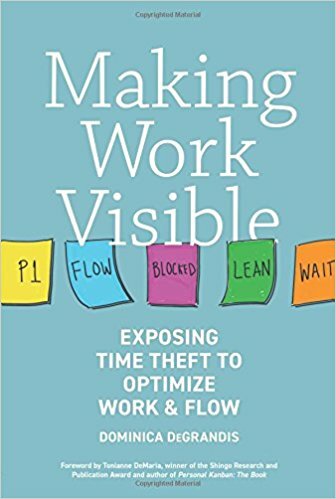 It's time to make work visible. Why do most leaders or managers elicit merely competent performance from their followers, while a select few inspire extraordinary achievement? Leadership expert Bernard Bass takes this question beyond the usual speculation, presenting original research that for the first time documents the traits of the exceptional leader. For half a century, leadership studies have focused primarily on "transactional" leaders: those who provide well-defined rewards to their followers -- whether they be office employees, community volunteers, or infantry soldiers -- for well-defined services. Because they are harder to study and measure, "transformational" -- or charismatic -- leaders have been largely ignored. Until now. Leadership and Performance Beyond Expectations represents a major breakthrough in our understanding of who these leaders are, how they get results, and why their leadership often exceeds all expectable limits. In its most complete summary to date, Bass reviews the theory and research on transformational leadership. He closes the gap between the work of social and organizational psychologists, whose focus has been on small groups and institutional settings, and that of political scientists and psychohistorians, who have done most of the important studies of world-class leaders. To these previous studies Bass adds his own crucial findings. He shows that charisma is not a rare phenomenon -- many of us are blessed with it in varying degrees -- and he suggests ways to identify and encourage it in corporate, educational, governmental, and military settings. Bass also provides an important Leadership Questionnaire for measuring both transactional and transformational traits -- a tool that is sure to become heavily used for individual self-appraisal and personnel evaluations in a variety of organizations. And he presents numerous examples of real-life transformationalists, including Thomas J. Watson of IBM, Lee Iacocca of Chrysler, Steven Jobs of Apple Computer, George F. Johnson of Endicott-Johnson, and such historic nonbusiness leaders as Jane Addams of Hull House, General George S. Patton of the U.S. Third Army, and Robert Hutchins of the University of Chicago. Not all charismatic figures are born leaders; some can be nurtured in organizational contexts. Tracing the interrelated effects of personality and environment on leadership, Leadership and Performance Beyond Expectations will change ideas about what a leader is at both the personal and institutional level. It is bound to alter the course of leadership research for the next decade. Transformational Leadership, Second Edition is intended for both the scholars and serious students of leadership. It is a comprehensive review of theorizing and empirical research that can serve as a reference and starting point for additional research on the theory. It can be used as a supplementary textbook in an intense course on leadership - or as a primary text in a course or seminar focusing on transformational leadership. New, updated examples of leadership have been included to help illustrate the concepts, as well as show the broad range of transformational leadership in a variety of settings. New chapters have been added focusing specifically on the measurement of transformational leadership and transformational leadership and effectiveness. The discussion of both predicators and effects of transformational leadership is greatly expanded. Much more emphasis is given to authentic vs. inauthentic transformational leadership. Suggestions are made for guiding the future of research and applications of transformational leadership. A greatly expanded reference list is included. Software is becoming more and more important across a broad range of industries, yet most technology executives struggle to deliver software improvements their businesses require. Leading-edge companies like Amazon and Google are applying DevOps and Agile principles to deliver large software projects faster than anyone thought possible. But most executives don’t understand how to transform their current legacy systems and processes to scale these principles across their organizations. Leading the Transformation is executive guide, providing a clear framework for improving development and delivery. Instead of the traditional Agile and DevOps approaches that focus on improving the effectiveness of teams, this book targets the coordination of work across teams in large organizations—an improvement that executives are uniquely positioned to lead.